The new face of Elements Eco-efficient Residences – a new high-rise condominium located at Kapitolyo, Pasig — is a former 2006 Ms. Philippines Earth and currently one of the hosts of Mornings@ANC. New celebrity endorser Ginger Conejero cannot hide her excitement in endorsing the new innovation in condominium living. Ginger intimates that she was fresh from the United States when she came to the Philippines to represent the country in the environmentally-focused beauty pageant Ms. Earth. 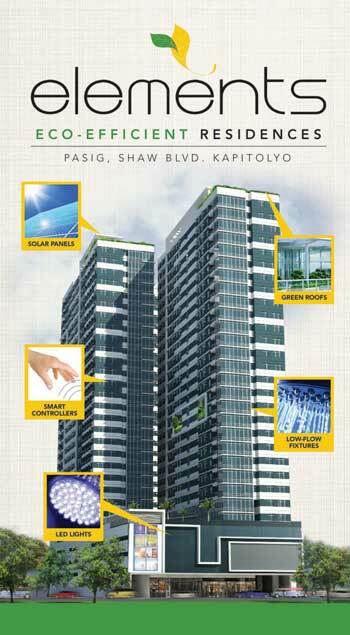 There is a lot to be excited about in the features of Elements Eco-efficient Residences. The 28-story, twin tower residential condominium will use eco-efficient features that incorporate energy conservation and recycling without sacrificing the full amenities of condo living. Both towers will have renewable energy (solar panels), rainwater catchment systems, a green roof and hanging garden, motion detectors, Light Emitting Diode (LED lighting), Low flow toilet fixtures, and a pro-active recycling system. Its two towers are aptly called Nerou (water) and Aire (air). “My favorite feature would be the solar panels. As far as I know no residential areas here use solar panels. I think ADB (Asian Development Bank) is the first building to use solar panels here in the Philippines but it’s not a residential or living area. In fact, when I was talking to other people, a lot of them liked the idea of solar panels in a residential area, especially since we have very high cost of energy here in the Philippines. At the onset, it may seem expensive to put up but in the long run, it not only saves you money but also helps preserve the environment,” Conejero said. The Elements Eco-efficient Residences also impressed her in its state-of-the-art technology. Ginger also recalls the moment she became a finalist in the Ms. Earth competition and bagged the Ms. Air award and how it impacts on her endorsement today. The Elements Eco-efficient Residences also features water conservation and a pro-active recycling system. All these other features are more than a plus for Ginger’s ideal abode. When asked about the location, Ginger replied that she is thrilled that the green condominium she will be occupying is just along Shaw Boulevard in Barrio Kapitolyo, Pasig City. “First place I lived in when I decided to stay in the Philippines was along Shaw. I loved this area because it was equidistant to all the places I had to go. This area is very familiar to me. “I know it firsthand. It’s very central and everything is within reach. You have a lot of options to go anywhere, you can use C-5, go straight, use EDSA, take a taxi, ride the MRT. The big malls are right there. And since Elements Eco-efficient residences will have its own commercial center- The Capitol Center everything will just be around the corner. It’s so central. For someone like me who doesn’t have the time or inclination to cook, all I have to do is go downstairs and I already have a whole lot of options,” she said. Ginger Conejero is happy that all the amenities of a comfortable condo living is guilt-free. The environmental features of Elements Eco-efficient Residences help make the building a boon to the environment instead of draining the planet’s resources. “These residential towers are really innovative. Moreover, their corporate responsibility is imbedded. They know how to give back. I hope many other development projects follow suit,” Conejero ends.